Anybody want a heart rate monitor? I have two available – one from 1995 and another from 2007! Why am I selling these? Well, I’ve upgraded to the Polar CS600 which supports wireless power measurement at 1s intervals (the Polar S725x only records at 5s intervals). This well-used monitor is in great condition. I just replaced it with a new Polar CS600 that has a few more cycling-specific features that I wanted. Still, this monitor is a great heart rate monitor with a bazillion features which you can read up about on the Polar website or any of the many ebay listings. What is included: Everything you see in the picture, plus the bike mount, speed sensor and magnet! Also includes the watch itself, the original heart rate monitor strap (new battery! ), original user’s manual, tip sheet, Polar ProTrainer 5 software, AND an off-brand USB-IrDA adapter in case your computer doesn’t have an Infrared port. Please note that the IrDA adapter is not usually sold with this monitor so that is a bonus! IMPORTANT: A few weeks ago I replaced the battery on the heart rate monitor strap so there is a new battery in the heart rate monitor strap. The watch unit is still going strong, but I would expect the battery for the watch unit will need to be replaced within the next year or two. The watch unit uses a typical watch battery. The heart rate monitor strap has a slight amount of corrosion from sweat at the contact point with the wireless transmitter. This has not caused any problems with heart rate readings or transmission. 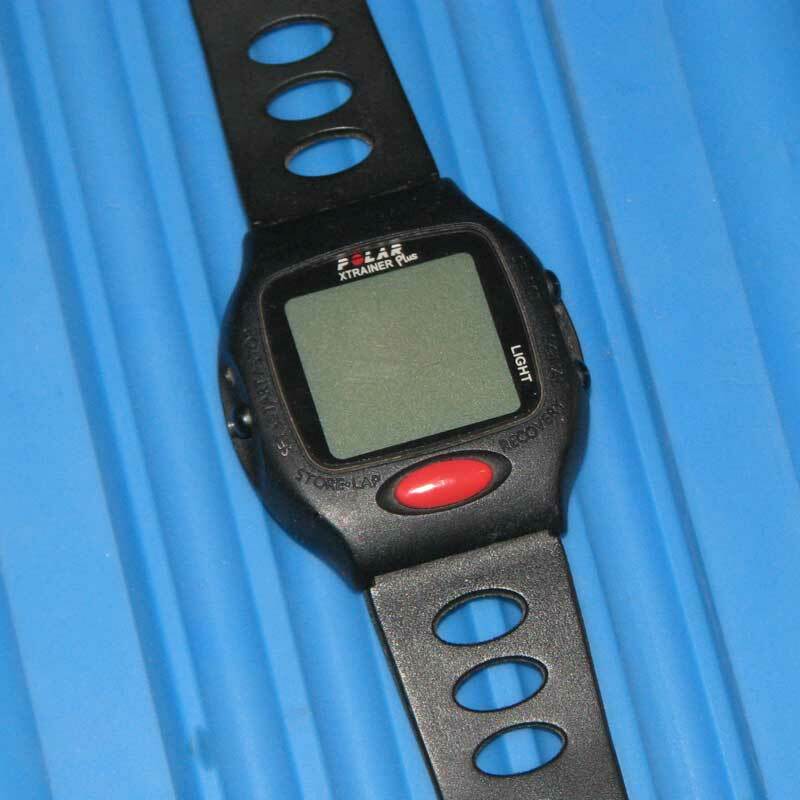 I used this heart rate monitor for about four years while I was racing for Clemson University from 1994-1998. It worked great, and I replaced the battery one time. When the battery ran out a second time a couple years later, I decided to replace the heart rate monitor instead of the battery! So I’ve had this monitor laying around forever. It has the ability to work with the old Polar sensors for speed and cadence – but I don’t have those sensors. I also do not have the heart rate strap. NOTICE: The battery needs replacing so I cannot verify whether or not the item works at this time. It was working well when I quit using it years ago. IMPORTANT: The only thing that is included with your purchase is what is shown in the picture — the heart rate monitor watch. The actual heart rate strap is NOT included, but may be available for purchase somewhere? 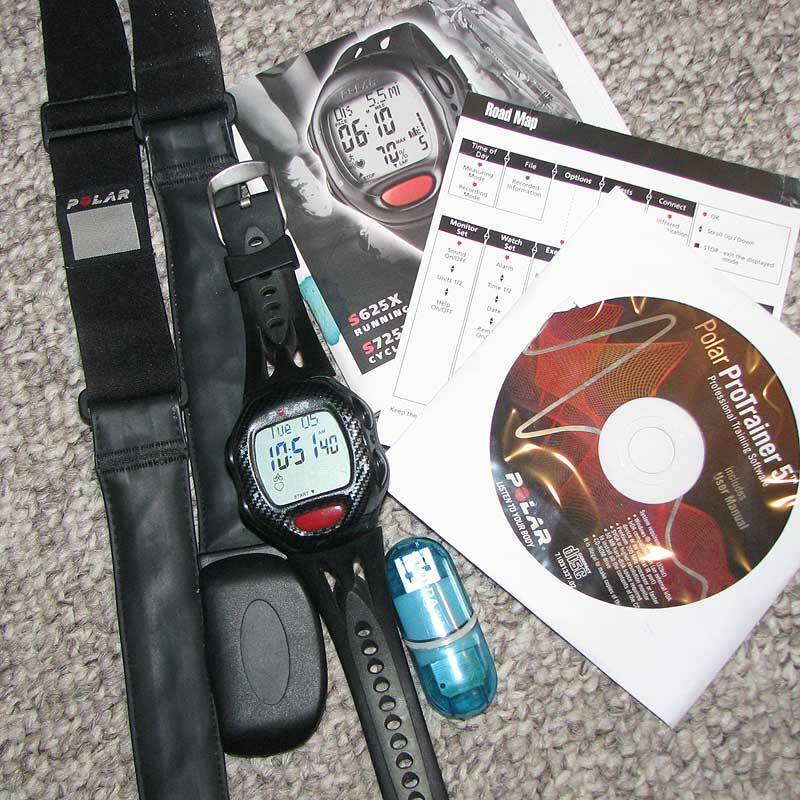 This purchase would be ideal for you if you already have all the accessories for this old heart rate monitor and your old unit has died and you need to replace it. LASTLY: I will ship this in a padded envelope to the winning bidder. There is a very small minimum bid price of $5 to make sure that this is actually worth my time. This entry was posted in Misc and tagged forsale on August 5, 2008 by kartoone.